There have also been many side projects to this; one of which was very dear to my heart, this was to transcribe the resting places of the burried, using pictures of the gravestones from my local cemetery. This cemetery was the one which the local library now stands on, the stones were saved from demolition and were placed around the perimeter walls of the library, the grave inhabitants were removed and reinterred in another cemetary. Once I started the project, back in May 2012, it soon became quite clear to me that there were a number of people that would be interested in the finished project, so this spurred me on. 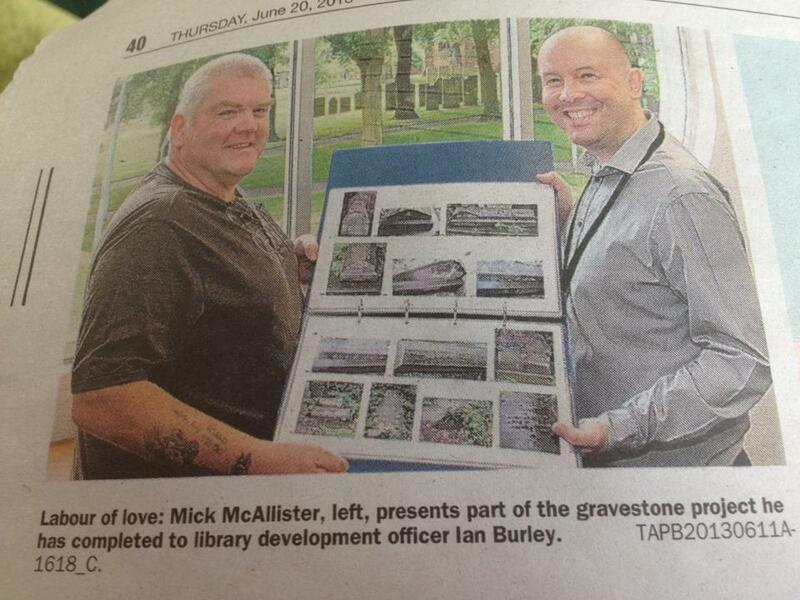 In June 2013, once the project was completed, I was able to present my finished project to the Local Library development officer. It was a great day and made more so by the attendance of the local newspaper. Below is a copy of the picture that was taken at the time. "I am offering a new service to all of my patrons, which is to Colourize Black and white pictures." For more information use this link to see some examples. "This has now entered the second stage with almost everything completed all barring the presentation." You can use this link to get the story. For a nice gift to all that wish it, I am offering all research at a one-off price of £350.00. I will go as far back as possible with everything included. We'd love to hear from you. why dont you complete our contact form and let us know what you think. and filling in a quick form.